Cluster development programs over the years have validated its role as a medium for donors and funding agencies to substance their fund for poverty alleviation program and improved employment opportunities by leveraging the limited funds through CDP. The patrons can use social capital as a tool to evolve an inclusive growth among MSME's and artisan based clusters. In developing countries most of the employment opportunities are created in informal sector such informal sectors are primarily in the form of micro and small clusters. Given that in India, there are more than 400 industrial and 4000 artisanal clusters thus, lies an enormous potential of untapped opportunities and areas for development. The primary aim of any Regional or Central government is productive and successful running of government schemes. However, this task is often met by challenging economic environment such as that of developing the interest of stakeholders in government schemes and evincing the interest of beneficiaries in the development process. Public and private sector both are instrumental in the assimilation of the majority of development programs and schemes through the Cluster Development Programs. In India, more than ten government departments and Ministries are intensively practicing CDP as the primary vehicle for the efficient development of their programs and schemes. Other than Government agencies there are banks including central bank which makes use of CDP in the lending process. The Private sector players use CDP for infrastructure creation in clusters ecosystem. Traditionally, cluster specific industry organizations in the cluster development programs were not known to active participants in the Cluster development programs. However, the experience of some of proactive Industry Associations like Tirupur Exporter Association (TEA) has created a lot of interest in developing active roles of such associations. Industrial and artisanal associations establish a sense of trust and help adopt the schemes rapidly. The lack of awareness of the cluster development programs acts as a hindrance to the process. Thus, there is a need to realize the potential of Cluster Development Programs. We have commissioned many such industrial associations to recast their role from small lobbying bodies to development catalyst by adopting the cluster development philosophy. Clusterkraft being a project implementing agency has its access to various sectors and locations, which makes us the suitable choice for the project implementing agency seeking handholding support for their projects. We provide coordination and support to such organizations in their project implementation, evaluation and post implementation progress agenda. CDS team has worked on Hand Holding and Strategic Inputs in CDP, CDE Training, for Khurda Metal Bell Cluster. The services were offered to EDI. We have formulated SITP scheme through IL&FS for the Ministry of Textiles,Government of India. Various Government Schemes and programs are implemented via international and national donor banks and specialized institutions. The major challenge is implementing the scheme in eligible regions. The process involves spreading awareness among stakeholder and evincing the interest of beneficiaries in the development process. CDP incorporates stakeholders in the development process and makes them participatory stakeholders in any given schemes and programs. Technical Consultancy Organizations purpose is technology up gradation of MSMEs. Technology in the MSE sector includes the ability to integrate various primary techniques, which may be complementary in nature and customized to the given cluster. Due to the contradictory nature of MSEs, innovation opportunities differ significantly; some firms are ready to introduce changes relevant for the growth grounds. It is crucial for the cluster to update technology for quality improvement and sustained business growth. For better functioning, MSME's need of conventional technology up-gradation services in the cluster is fulfilled by these organizations. 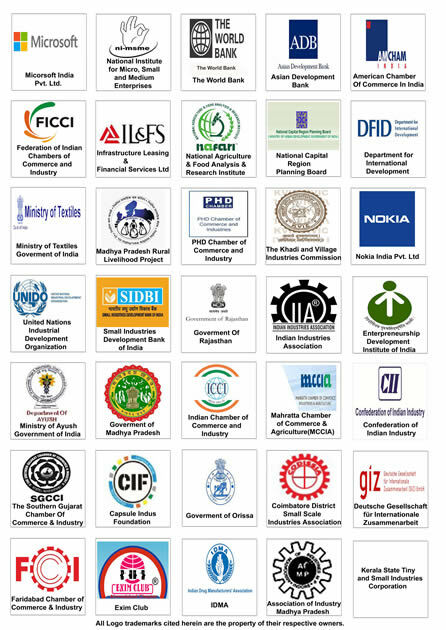 ACDS act as a platform for sharing information, regarding current technology and MSME networking for service exchange with these consultancy organizations. Skill development and up-gradation on a regular basis are the primary tasks for Technical and Management Institutes. Also, skill up-gradation is one of the important criteria for development of cluster. These institutes have an obligation to update their skills on the regular basis that can only be achieved through maintaining flow of knowledge and information in the cluster. BDS Providers are an essential link to address a broad range of issues of the cluster such as poor management, weak marketing skills, inadequate technical know-how, lack of information and limited access to the market, to help them operate and grow their business efficiently. CDP act as a platform for BDS and MSME networking for service exchange. Multi-National Corporations also finds a prominent place in our target segment. ACDS LTD with Nokia and Microsoft is one of our most remarkable achievements in this field. We have been retained by Nokia for evangelizing its Nokia TEJ application in different SME clusters. Nokia TEJ is a mobile phone based request for order management and has the potential to lead a paradigm shift in the supply marketplace. Initially, we did a pilot (s) of Nokia TEJ in two textiles clusters in Bhilwara and Ludhiana. With Microsoft, we have done project Vikas which has stimulated penetration of IT services in SMEs which has given them a competitive edge. ACDS engagement with Nokia TEJ will create visibility, drive demand and increase the number of user with a local partner driven model in these clusters.